This question for our Pet Doc comes from the concerned owner of a three year old Shih Tsu named Toby Jo. What Do I Do if My Dog Eats too Fast? We got Toby Jo 6 months ago. He was running the streets (downtown area) for who knows how long. He was hit by a car. Toby was rescued off the streets by a friend who took him to the Vet. They x-rayed him, etc. He was filthy, and had a lot of fleas. The vet gave Toby a bath and two kinds of flea meds. He didn’t have a collar or computer chip. we ended up with him. I named him. He is lovely but the vet said he is a glutton. In other words, he eats very fast. That was his lifestyle on the streets. The vet suggested that we spread his dog food out on a large cookie sheet so he has to hunt for it and that might slow him down. Well, we used this technique for a long time and it seemed he was doing good, not eating quite as fast. Then this past week, he started throwing up again. Today he threw up twice. I gave him cottage cheese the other day instead of food for one meal. That seemed to work. Then we put him back on his dog food. I buy Fromm Gold Nutritionals dog food which should be good for him. We also give him all natural dog treats. Toby Jo gets very excited when we come home and jumps up like a Jack Russell. He is a pure bread Shih Tzu though. He loves to take walks everyday, and loves to sun out on the deck. I don’t really know what to do. We feed him one fourth a cup, three times a day. Do I need to cut that in half more often during the day? He is up-to-date on all his vaccines and he has been fixed. He just got his booster shots also. Please help Toby eat slower and keep his food down Pet Doc! Any advice would be helpful. When Did Toby Start Eating So Fast? When we first got him six months ago. How has his eating habit changed? Not a whole lot. I asked his vet about it and he said he is just a piggy eater, and that we should put food on a cookie sheet to slow down his eating. But it still happens once in a while where he eats too fast and can’t keep his food down. Thanks for the question. 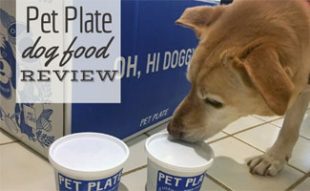 When your dog eats too fast, I have also recommended spreading dog food out like this to help keep dogs engaged and slow down a voracious eater. It has worked at times, and at others it won’t, in my experience. If this is Toby’s only issue, then I would recommend trying smaller and even more frequent feedings. That can be difficult as life does not allow for that at times. I am not a big fan of soft dog foods but this may help as well. Try mixing dry dog food with canned food. Lightly moistening the kibble could be of help as well. If all else fails, then ask your veterinarian for suggestions on antacids or other medications that may be valuable to you and Toby. He or she will be able to make the best suggestion, being familiar with your dog. I hope this helps and please keep us informed. The pet doc is a veterinarian who has consulted with our site for many years. While he is still practicing and licensed, he volunteers his time to help us educate you, our readers, and has asked to donate this time and contribution anonymously. HIs 10+ years of experience in the field is invaluable as he helps to answer our reader’s pet-related questions. And hopefully, you will find his insights and helpful tips as much as we do. 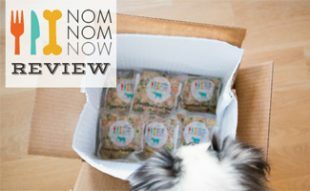 NomNomNow Reviews: Doesn’t Your Pet Deserve The Freshest Food? Have you considered giving your dog food that might be more digestible or easier to manage in smaller bites? Soft foods are well and good for the stomach, but the great thing about harder foods is that your dog usually has to chew them before swallowing! This creates a self-imposed time limit on your dog's feeding. Of course, sometimes the hard dog food bits are small enough to just swallow without any chewing, which does no good. In situations like this, you may want to think about cooking for your dog. I know, I know, this presents about seven additional problems, but it is one of the healthiest things you can do for your pet. Store-bought food in the bag or the can typically has lots of unnecessary and unhealthy elements, even in the most organic and "clean" versions. 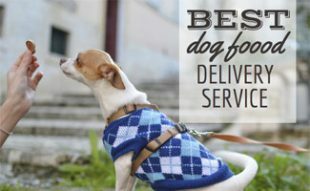 Very much like humans, the stomach of your dog is made for more natural fare, and may be complaining at the quality of the food as well as the speed of intake. So cooking small meals of chicken, veal, and other bits and pieces for your dog is not only an easy way to get rid of leftovers, but can also help improve digestion. When faced with a piece of chicken, your dog is more likely to chew it up and then swallow. Then, when it gets to the stomach it is very much in line with what your dog's biology is expecting, so keeping food down may not be as much of a challenge under this regimen. Not that this will automatically solve problems – if your dog scarfs down too fast, not much will help, even home cooked food. But I think it may be worth a try, just to see if there is any noticeable improvement. Of course, you should also consider the psychological issues at play. Sudden changes in the home environment can provoke all kinds of unexpected behavior, especially when it comes to feeding time. Since your dog has always had this problem, it probably is a throwback to life on the streets, but you may to include other types of treatment as well. Your vet can probably suggest other methods beside a mere change in diet, too. Perhaps a better exercise program would do the trick? Part of the problem may be a little bit too much latent energy on the part of your dog. This energy can burst out in unexpected ways, leading to issues such as eating too quickly. It could also be a sign that your dog still feels uncomfortable or unsure of the new environment. Switching the eating station to a new venue that feels more protected may help a lot, or changing the times and ways in which you feed. Like I said, there are many different potential suggestions to help with behavior problems related to food. The article is absolutely right: your vet will typically be able to offer the best advice. Good article! It is also important to note that the difference between your dog eating too much too quickly and eating slow enough to prevent problems is very small – especially in the smaller breeds, who tend to be energetic around food time and like to pounce at their meals. The difference of only a few minutes can be very important. Sometimes it only comes down to a few seconds – enough time for the muscles in your dog's mouth and esophagus to get used to the incoming food! Unfortunately, spreading your dog's food out over a sheet is not always a big enough difference to prevent problems. On one hand, it does solve a few problems. 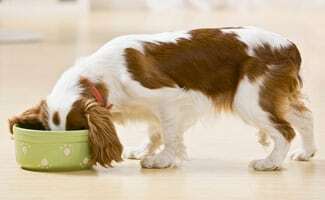 By making your dog move into different positions for various bites of food, the act of eating too quickly is typically reversed and most of the problems can cease. But there's also some geometry to consider. With a small dog, darting all along one plane (the floor) comes very naturally, especially when they are after food. Moving from bite to bite over a sheet may not take much more time for an eager dog than eating food all from one bowl. Also, the excitement of seeking out and eating more food along the sheet can create its own problems. Like humans, dogs sometimes forget to chew and swallow because they are too busy darting around their plates and stuffing their cheeks! The result is a huge mouthful of food with nowhere to go. So, under circumstances like these, the sheet method may not be the best solution. What are the alternatives you could use? Well, the best and easiest alternative is hand feeding. This works best with puppies, because you can also get the puppy used to your presence and your involvement in food – one of the most jealously guarded possessions of any dog. While trainers can give you more specific information, this technique involves putting down food piece by piece in front of your dog. Each piece should be bite-sized and easily digestible. The dog eats the bite, and then eagerly waits for more, but you control the time between each bite by administering the next bit of food. This works, but can be tricky – for example, directly plopping food in your dog's mouth is a bad idea for several reasons, but may be unavoidable. Another potential option is a special dish that only allows a dog to access a certain amount of food at any one time. The DogPause bowl is only one such product. It contains four different sections that a dog has to tackle separately. Not only does this create four different pauses in eating, but the sections are very deep compared to most dog bowls. This means that your dog has to go hunting for the last scraps of food in each section, which is also very useful when encouraging a dog to slow down. My black Labrador had a similar issue in that he was choking because he was eating far too quickly. He has an extremely sensitive stomach and quite a few allergies so I wanted to avoid adding anything to his allergy friendly kibble so I researched slow feeders. There are a number of slow feeder bowls out there and I can’t remember exactly which brand we went with but we did manage to find a stainless steel slow feeder and it has made all the difference. All it is is a dog bowl with a hump in the middle so my dog has to slow down and takes his food in smaller bites. We went with stainless because we feel it is a more hygienic option. I came across your site when I was searching for the answer to this very same question. My little pup does the same thing, eats way too fast then ends up throwing some of it up minutes later! I will have to give these tips a try, thank you so much for sharing. Comforts me in knowing I am not alone in this! I hope every thing works out with your Toby! Thanks again for the advice! Raw food is best for your dog. Use a quick start guide to the raw food diet so you can begin reaching your goals today. Includes shopping lists, conversion charts and easy to follow step-by-step instructions. 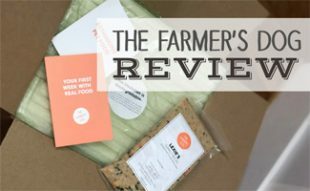 Delicious and quick recipes as well as reviews of the best raw food appliances.